Baldwin defends Allen, even as others distance themselves from the director. Alec Baldwin has called the public "renunciation" of Woody Allen and his work "sad" and "unfair," even as several actors have publicly distanced themselves from the director in recent days amid the resurfacing of sexual abuse allegations against him. "Woody Allen was investigated forensically by two states (NY and CT) and no charges were filed. The renunciation of him and his work, no doubt, has some purpose," Baldwin, 59, wrote in the first of two tweets today. "But it’s unfair and sad to me. I worked w WA 3 times and it was one of the privileges of my career." Baldwin's tweets came after actor Timothee Chalamet, the breakout star of "Call Me by Your Name," announced on Instagram that he was donating his salary from his role in Allen's most recent film, "A Rainy Day in New York," to charities that fight sexual abuse and harassment. The 22-year-old actor is the latest star to speak out after the director's adopted daughter Dylan Farrow recently penned an op-ed in the Los Angeles Times questioning why the #MeToo movement has seemingly spared Allen. After it was published, actress Greta Gerwig announced that she would never work with Allen again, while Chalamet's "Rainy Day" co-star Rebecca Hall said she was "profoundly sorry" and was donating her salary to charity as well. Mira Sorvino, who won an Oscar after starring in Allen’s 1995 film "Mighty Aphrodite," also apologized to Farrow in an open letter in the HuffPost and expressed her belief in and support of Farrow. 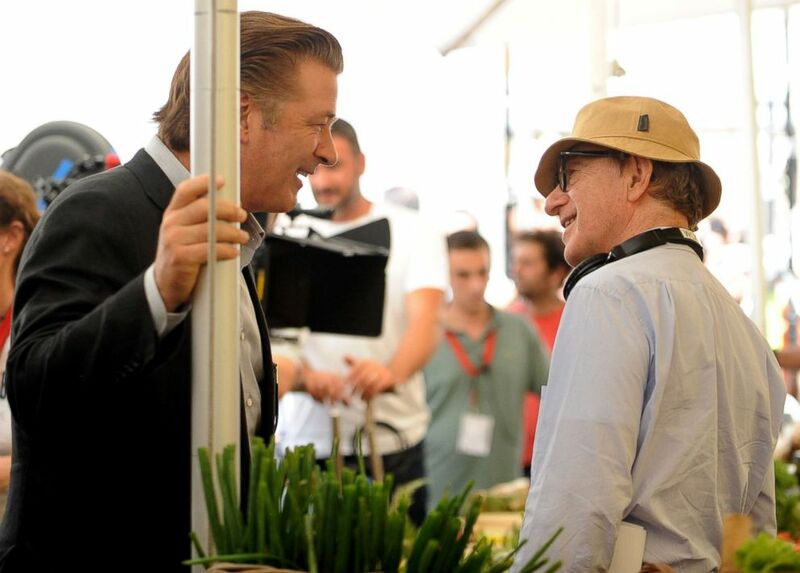 (Tiziana Fabi/AFP/Getty Images ) Alec Baldwin speaks to Woody Allen on the set of 'Bop Decameron' in Rome, July 28, 2011. But Baldwin cautioned that such accusations should be "treated carefully." "Is it possible to support survivors of pedophilia and sexual assault/abuse and also believe that WA is innocent? I think so," he tweeted. "The intention is not to dismiss or ignore such complaints. But accusing ppl of such crimes should be treated carefully. On behalf of the victims, as well." In 2014, Farrow wrote an op-ed piece in The New York Times, in which she told the story of how Allen allegedly sexually assaulted her at age 7. Allen has consistently denied the abuse allegation, maintaining his ex-partner and Farrow's mother, actress Mia Farrow, coached their daughter into making the claims. The director was investigated on child molestation claims for the alleged 1992 incident in Connecticut, but prosecutors elected not to charge him. "No one wants to discourage abuse victims from speaking out," Allen wrote in a letter published by The New York Times in response to Farrow's account, "but one must bear in mind that sometimes there are people who are falsely accused and that is also a terribly destructive thing." Allen's representatives did not respond to ABC News' requests for comment. This isn't the first time Baldwin has weighed in on the #MeToo movement. Last year, he briefly quit Twitter after he was criticized for "blaming the victim" in a "PBS NewsHour" about the sexual harassment allegations roiling Hollywood. Before signing off, he tweeted, "My goal is to do better in all things related to gender equality."